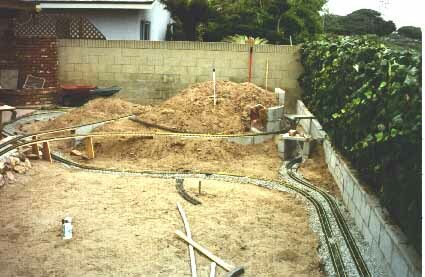 In one September weekend in 1996, my oldest son and I laid the entire 250' main line with LGB 1600 turnouts and Aristo 5' straight sections converted to flex track. Temporary structures were made from plywood to substitute for trestles and bridges that were eventually built for these locations. It is perfectly acceptable to get cheap and dirty to get track down as it can always be fixed later. It is important to check out the design and work out the bugs before too much is cast in concrete, although I poured a lot of concrete before I laid any track.